Since we started selling in this amazing vintage world, we cannot quite believe what the most sought after product has been. 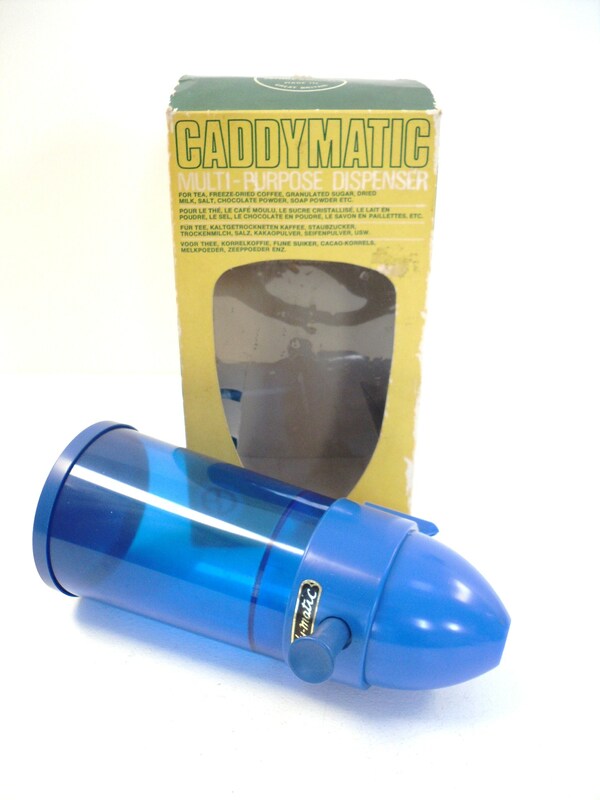 We have had so many enquiries about the 1960’s Caddymatic. Now, how many of you have actually heard of such a thing? It is a plastic tea dispenser that hangs on the wall in your kitchen. It could also be used for coffee, sugar…anything small that you need on a day to day basis. It is sprung loaded…the tea stays in the top half and is released when the button is pressed. I think it looks like a rocket…very 1950s inspired but was mainly produced in the 1960s. It was made by Arthur Douglas in England. Our blue one came in it’s original box! They mainly came in blue, red or orange but I have seen brown ones before too. Some have the original sticker on the front. 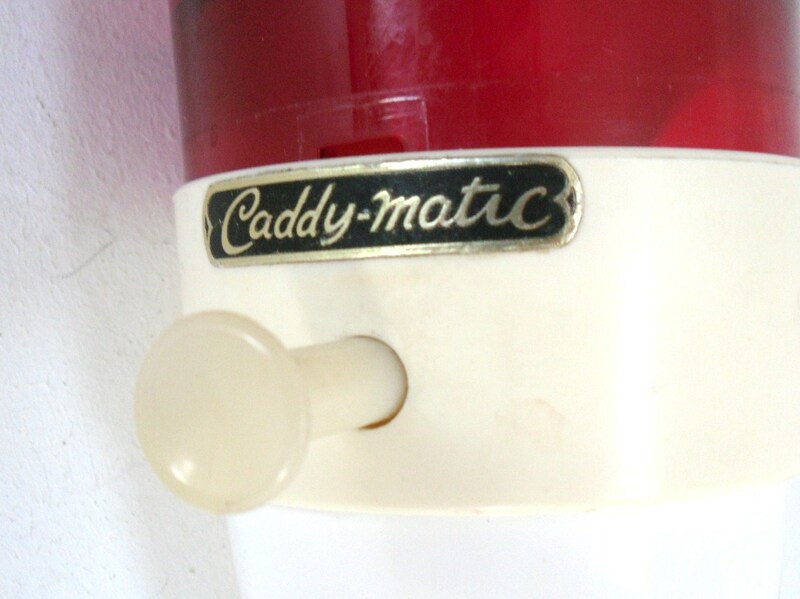 They also came in a smaller size and were called Caddymatic Junior. This was perfect for a tiny space! They are a great piece of collectable kitchenalia and are a must have for a retro home. They are pure caddy magic! « Play The Vintage Way! 13 Comments on Caddy Magic! These are too cool for school! I’ve never come across this make before. Excellent finds! Thanks! they are really fun!! I’m looking for a vintage toy and came across your blog!! We used to play with this plastic rolling seat (a chair with a back and two sides but no legs), that had a flip lid for storage and a phone on the side of it. We used to scoot all over my grandparents house on it. Now that I have kids of my own I’m trying to find it and I can’t find it anywhere, I tried google, amazon, ebay and etsy. Not sure of the brand or the official name. Can you help?? The caddymatic was used for parts on at least 2 different space ships from Space 1999. There is a big demand for them from the studio scale modelers who reproduce those ships. My father owner the factory (Auther Douglas ltd) that produced the caddymatic back in the 1970’s ,a good seller all over the world . Does anyone know where I can buy a Caddymatic. ? Whilst I was collecting my purchases at an home auction in Tasmania, I noticed a red spacey like dispenser in the kitchen, I played with it for a few seconds and then the brain remembered! Its a tea caddy and exactly the same red 1950’s one as my nanna in brissie had! The auctioneer didn’t know what it was and allowed me to take it for free. My parents will be stoked with it, all though i would mind keeping it myself 🙂 its such a funky item! I’ve got a mottled brown and cream Caddymatic and I’ve used it for tea dispensing all my married life. When my Mum died I acquired her blue one so that I have a spare. Don’t know what I’d do without it!